The increasingly use of microprocessors or microcontrollers in safety-related products for machinery sector such as controls and sensors has led to particular requirements being placed upon their safety. The devices that use this kind of devices are called “safety blocks” in machinery directive 2006/42/EC, safety functions or E/E/PES systems in IEC 61508. The difference with normal devices is that the response of the controller in the event of a fault must be deterministic and the time duration must be under control. In addition the way of dys-functioning of the safety device in hazardous situation must lead to a safe state. In order to realize the two objectives safety standards defines methods and rules in order to control the failures. These measures are specific and have to be taken during the design of the safety system. 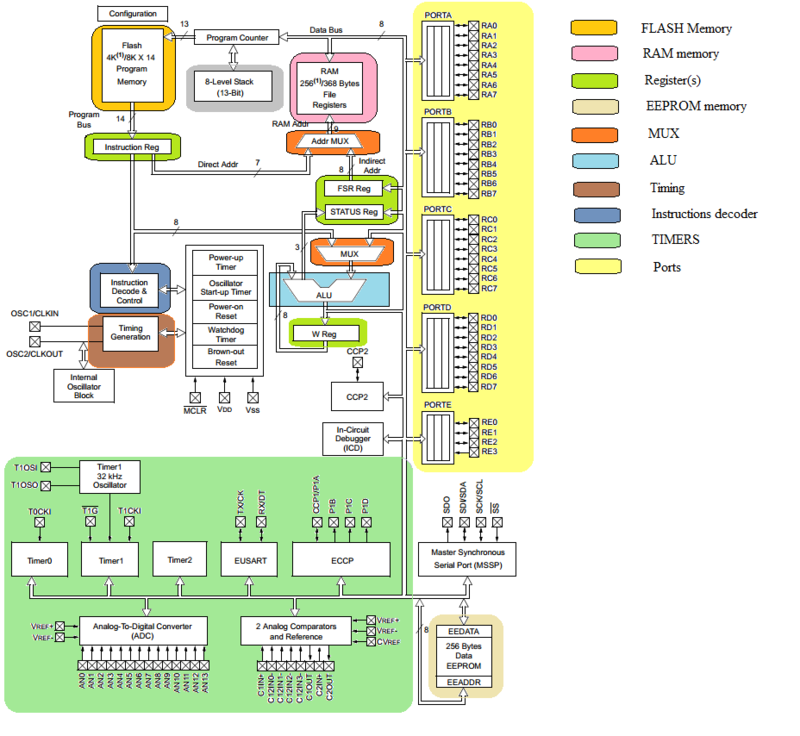 This page describes processor tests commonly called SELF TESTS that help to make the safety device more robust in terms of safety-related applications. The measures presented hereafeter are common measures that helps designers to satisfy the requirements of IEC 61508 and EN 13849-1, IEC 62061. These measures are possible solutions, and MUST be regarded as examples only. For each of these blocks, a failure can occurs and the consequence when the device is intended to perform a safety function is to loss the safety function. The different block must be tested. The followings hereafter defines the techniques that can be used in order to test the different ressources. Some of them are defined in standards e.g. IEC 61508, and some others are defined in the relevant litterature. These kinds of tests are called SELF TESTS, because they test only the HARDWARE ressources of the device and they do not test the function that is programmed inside the device. 4.19 - RAM test "checkerboard"
4.20 - RAM test "March"
4.22 - RAM test "Walkpat (walking pattern)"
Today the reference document for test and safety devices is defined in IEC 61508. This standard defines in part 2 of the standard the requirements and the detailled information are presented in part 7 of the standard.